On-Campus Recruiting (OCR) provides employers with the opportunity to host information sessions, attend career fairs, industry showcases, and conduct interviews on campus. On-Campus Recruiting offers direct access to some of the most competitive companies and opportunities in the job market today. Through OCR, employers can connect with you and provide information about their industry, company, and employment opportunities. It is important to keep in mind that On Campus Interviews (OCI) are just one resource to use in your career search. On-Campus Interviews can be found in LionSHARE, under “Jobs” and then selecting “On-Campus Interviews.” While OCI is a fairly straightforward process, it requires attention to employer-specified deadlines and often demanding interview schedules. If you do not see companies of interest through OCI, it does not mean they aren’t hiring. Companies hire “as-needed” and post opportunities in various ways including LionSHARE, social media and other job boards. Prior to applying to On-Campus Interview (OCI) opportunities in LionSHARE, you should review the On-Campus Interview (OCI) Guidelines along with the OCI video tutorial. You can find dates and locations for employer information sessions on the CCE calendar and in LionSHARE. In both the fall and spring semesters, employers are invited to attend our Career Fairs, including the Undergraduate Career Fair, the Engineering Career Fair, the Spring Career Fair and the Startup Career Fair. With an investment of only a few hours, these fairs are a great way for you to meet with employers and alumni from various industries and organizations. Career Fairs host between 50 to 130 employers per fair. Additional information and upcoming CCE Career Fairs can be found in LionSHARE. Each semester we co-host several Industry Showcase events. These are great events for companies that are new to campus and seek to build brand recognition. 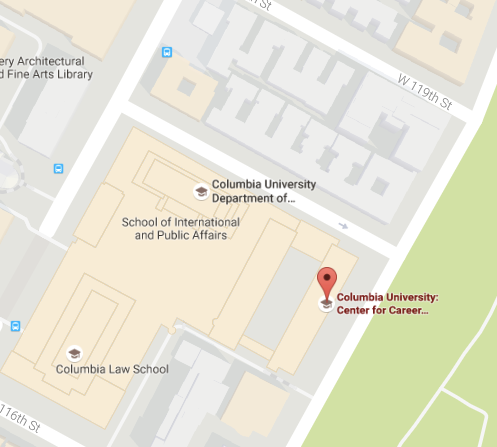 Employers are encouraged to bring Columbia alumni as well. These events host 8-15 employers from within a common industry attracting students who are interested in learning more about opportunities and career paths within that field. Additional information and upcoming Industry Showcases can be found in LionSHARE, under the “Fairs” tab. On-Campus Recruiting occurs throughout the academic year. In the Fall semester, this begins in September and runs through December. For the Spring semester, recruiting occurs from the end of January through April. Employer deadlines are rolling, keep an eye out in LionSHARE and favorite employers of interest to stay up to date on application deadlines. Review the CCE Calendar to see when employers are coming to campus for information sessions, career fairs or industry showcase events.